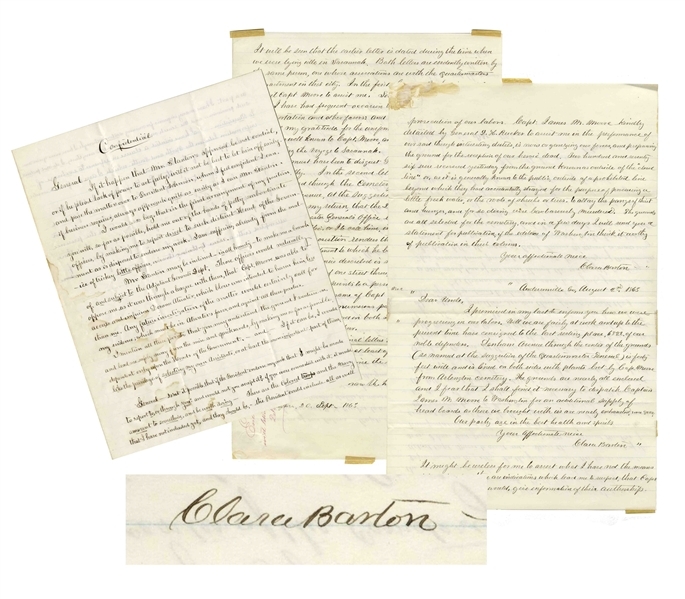 Important autograph letter and report signed four times by Clara Barton, regarding her work in identifying the Missing Soldiers of the Civil War, which Barton led alongside Andersonville POW Dorence Atwater, who kept the ''death list'' that instigated the project. 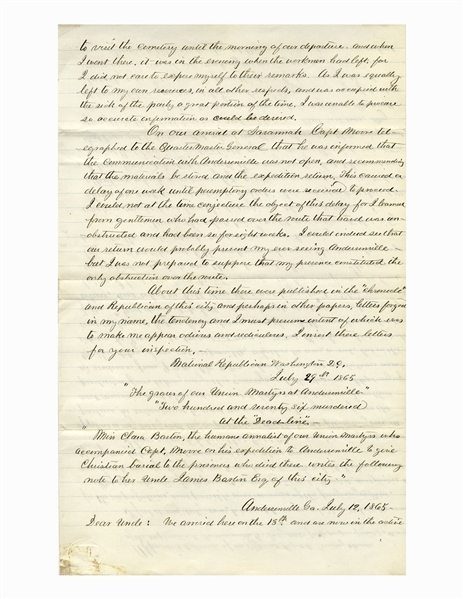 In this letter and report to Barton's ally General Benjamin Butler, Barton not only comments upon Atwater's infamous imprisonment, but alleges that a systematic campaign to undermine her had been hatched during the Andersonville expedition, even to the point of sending forged Letters to the Editor in Barton's name, so that she would ''appear odious and ridiculous''. Barton's nemesis in this was Captain James Moore, who was, she claimed, trying to take credit for the work that Atwater and Barton had already done to identify the soldiers. 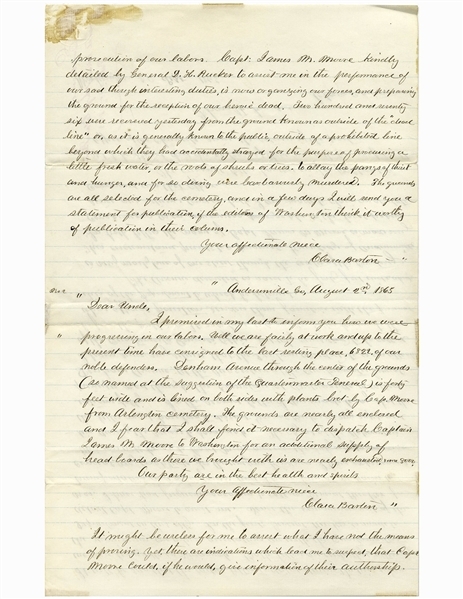 Barton also claims that Moore was behind the imprisonment of Atwater, who refused to relinquish his personal copy of those who died at Andersonville; though Atwater had already provided all the names on his list to the U.S. government, he understandably wanted control over his original list, written while a POW at Andersonville where he was tasked with inventorying the dead every day. 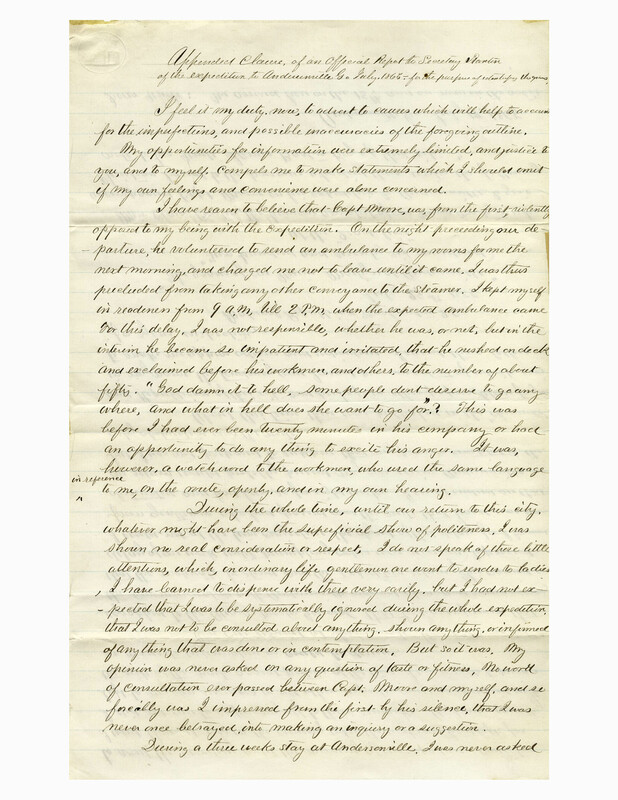 The next four pages are penned by Barton on stationery measuring 8'' x 12.5'', entitled ''Appended Clause, of an Official Report to Secretary Stanton of the expedition to Andersonville Ga July 1865 - for the purpose of identifying the graves''. 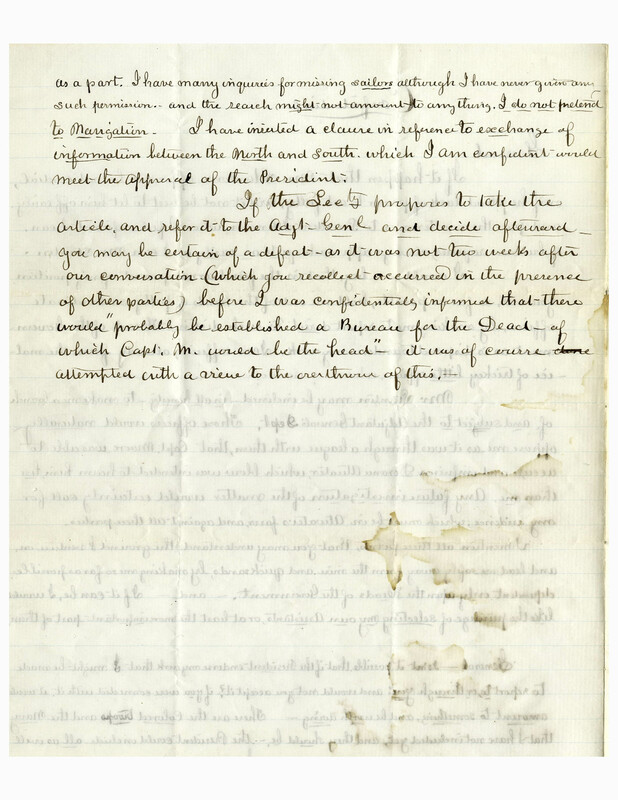 With beautiful, elegant penmanship, Barton lays out the problems she encountered during the trip, in part, ''...I have reason to believe that Capt. 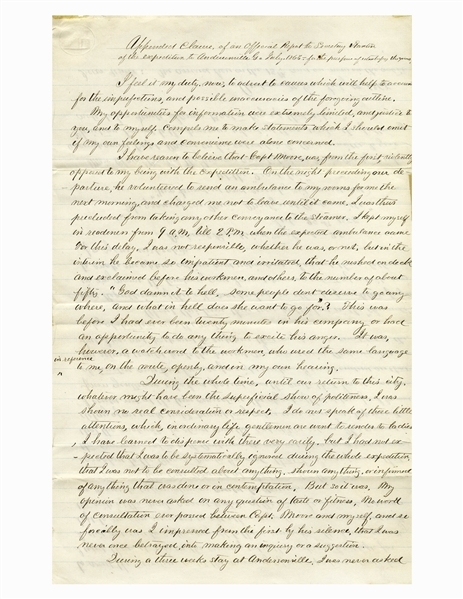 [James M.] Moore was, from the first, violently opposed to my being with the expedition. On the night preceding our departure, he volunteered to send an ambulance to my room for me the next morning, and charged me not to leave until it came. I was thus precluded from taking any other conveyance to the steamer. I kept myself in readiness from 9 a.m. till 2 p.m., when the expected ambulance came. For this delay, I was not responsible, whether he was, or not, but in the interim he became so impatient and irritated, that he rushed on deck and exclaimed before his workmen, and others, to the number of about fifty, 'God damnit to hell, some people don't deserve to go anywhere, and what in hell does she want to go for?' This was before I had even been twenty minutes in his company or had an opportunity to do anything to excite his anger. It was, however, a watchword to the workmen, who used the same language in reference to me, on the route, openly, and in my own hearing. During the whole time, until our return to this city, whatever might have been the superficial show of politeness, I was shown no real consideration or respect. 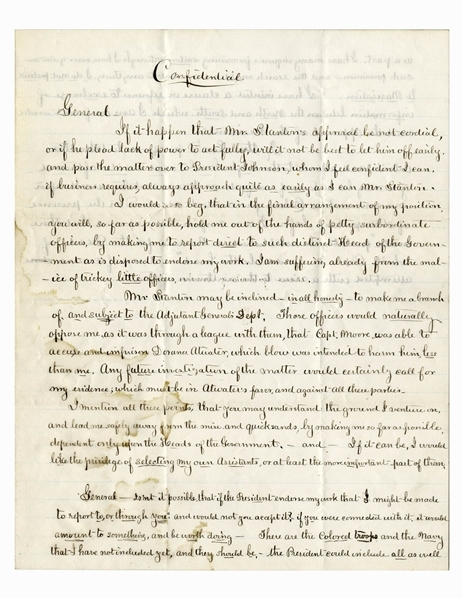 I do not speak of these little attentions, which, in ordinary life gentlemen are want to render to ladies, I have learned to dispense with these very easily, but I had not expected that I was to be systematically ignored during the whole expedition, that I was not to be consulted about anything, shown anything, or informed of anything that was done or in contemplation. But so it was. My opinion was never asked on any question of taste or fitness, no word of consultation ever passed between Capt. Moore and myself, and so forcibly was I impressed from the first by his silence, that I was never once betrayed, into making an inquiry or suggestion. During a three weeks stay at Andersonville, I was never asked to visit the cemetery until the morning of our departure, and when I went there, it was in the evening when the workmen had left, for I did not care to expose myself to their remarks. As I was equally left to my own resources, in all other respects, and was occupied with the sick of the party a great portion of the time. I was unable to procure so accurate information as could be desired. On our arrival at Savannah Capt. 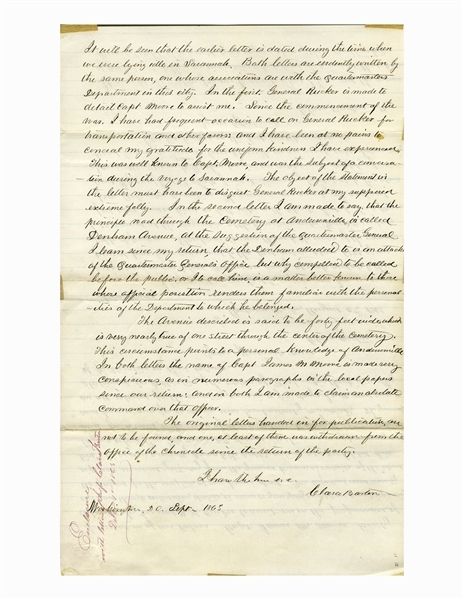 Moore telegraphed to the Quartermaster General that he was informed that the communication with Andersonville was not open, and recommending that the materials be stored and the expedition return. This caused a delay of one week until preemptory orders were received to proceed. I could not at the time conjecture the object of this delay for I learned from gentlemen who had passed over the route that travel was un-obstructed and had been so for eight weeks. I could indeed see that our return would probably prevent my ever seeing Andersonville - but I was not prepared to suppose that my presence constituted the only obstruction over the route. It might be useless for me to assert what I have not the means of proving, yet, there are indications which lead me to suspect that Capt. 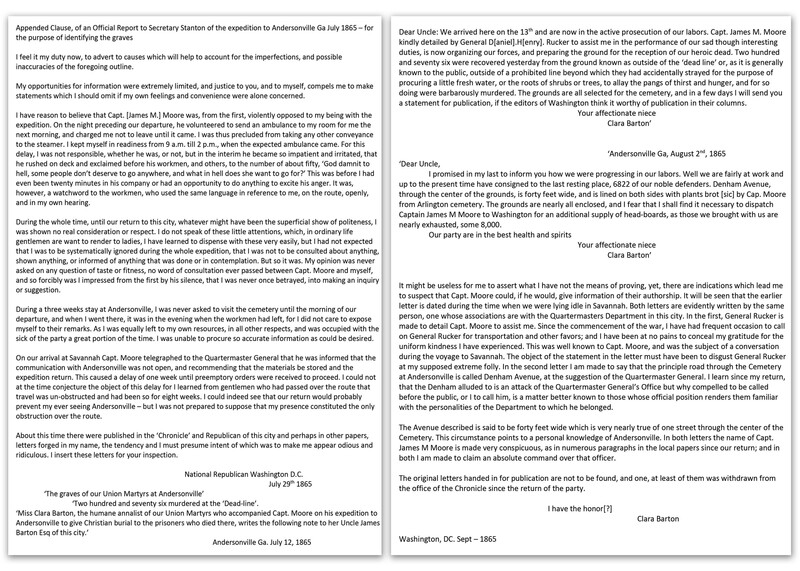 Moore could, if he would, give information of their authorship. 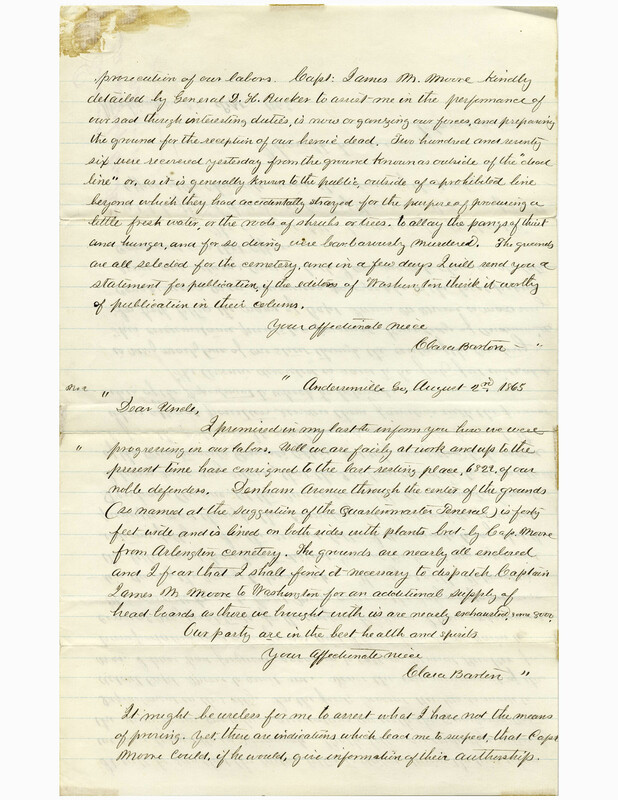 It will be seen that the earlier letter is dated during the time when we were lying idle in Savannah. Both letters are evidently written by the same person, one whose associations are with the Quartermasters Department in this city. In the first, General Rucker is made to detail Capt. Moore to assist me. Since the commencement of the war, I have had frequent occasion to call on General Rucker for transportation and other favors; and I have been at no pains to conceal my gratitude for the uniform kindness I have experienced. This was well known to Capt. Moore, and was the subject of a conversation during the voyage to Savannah. 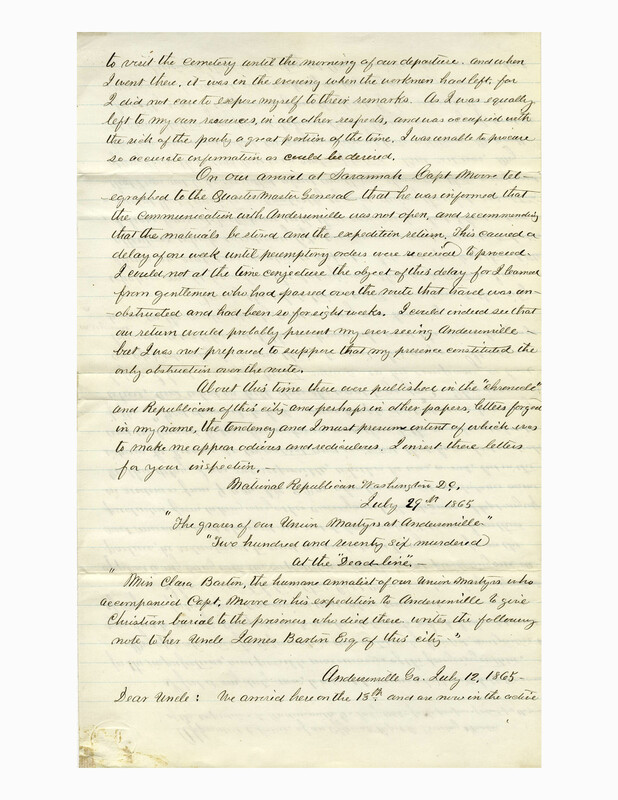 The object of the statement in the letter must have been to disgust General Rucker at my supposed extreme folly. In the second letter I am made to say that the principle road through the Cemetery at Andersonville is called Denham Avenue...The Avenue described is said to be forty feet wide which is very nearly true of one street through the center of the Cemetery. This circumstance points to a personal knowledge of Andersonville. In both letters the name of Capt. 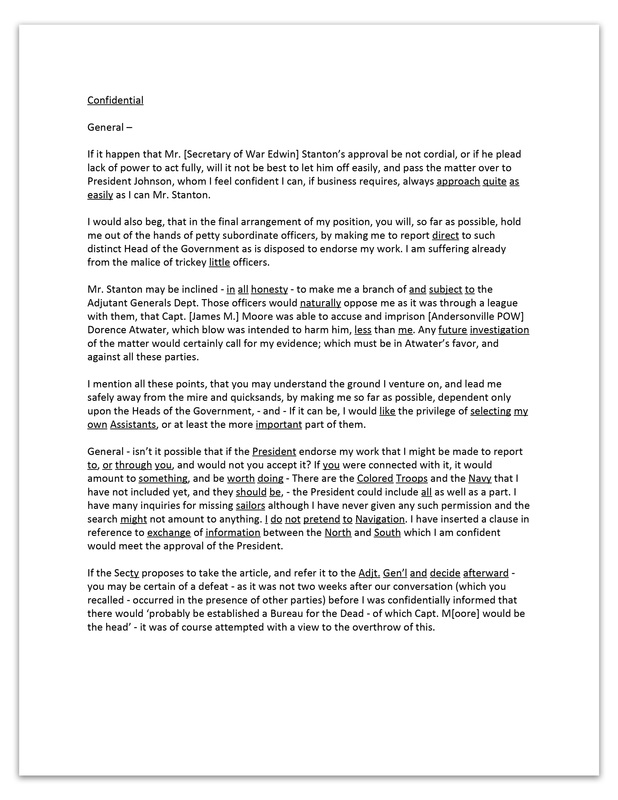 James M Moore is made very conspicuous, as in numerous paragraphs in the local papers since our return; and in both I am made to claim an absolute command over that officer. The original letters handed in for publication are not to be found, and one, at least of them was withdrawn from the office of the Chronicle since the return of the party. / I have the honor[?] / Clara Barton / Washington, DC. Sept - 1865''. 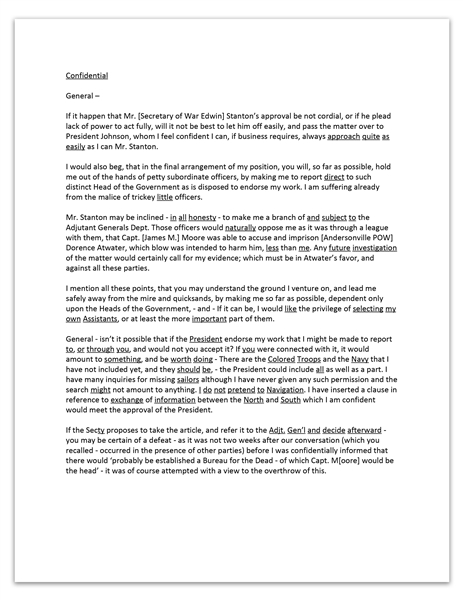 With docketing by Butler's office on the second page of the report. 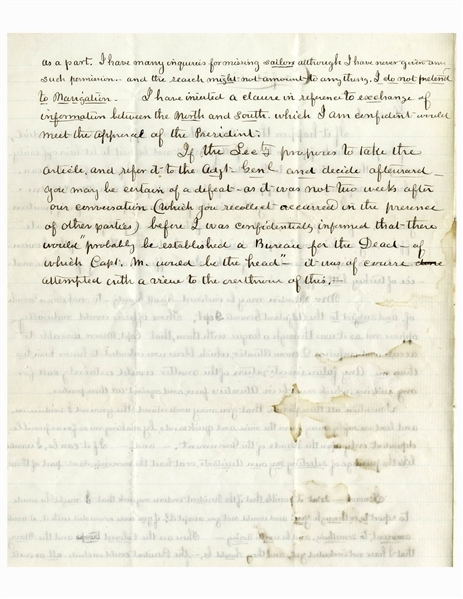 Folds to both documents, minute dampstaining to letter, not affecting content, and mounting remnants to edges of report, otherwise near fine condition. 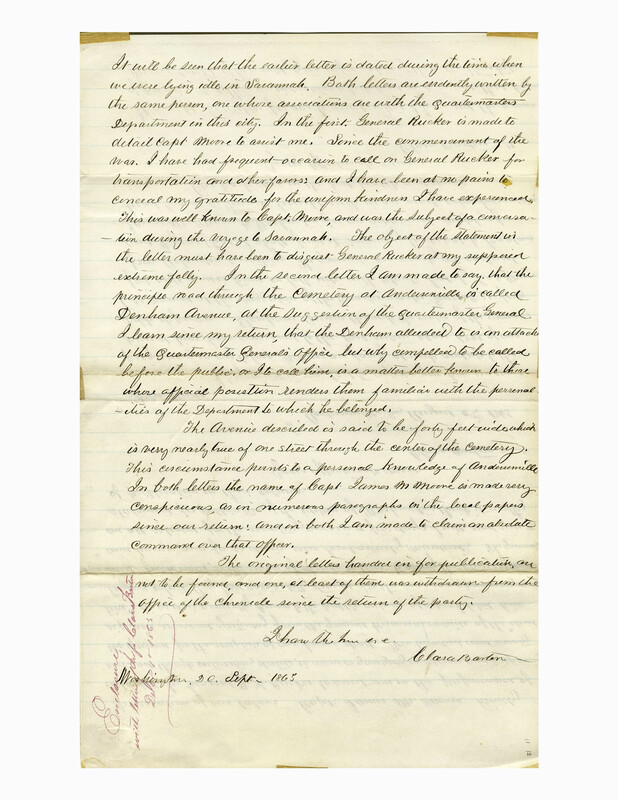 Unfortunately for Barton, General Butler was not able to intervene on her behalf, and Moore was named as Chief of the newly created U.S. Burial Bureau in late November 1865, approximately two months after Barton penned this letter and report. However, her work to identify the missing soldiers continued and, ultimately, history has credited Barton for the success of the project.